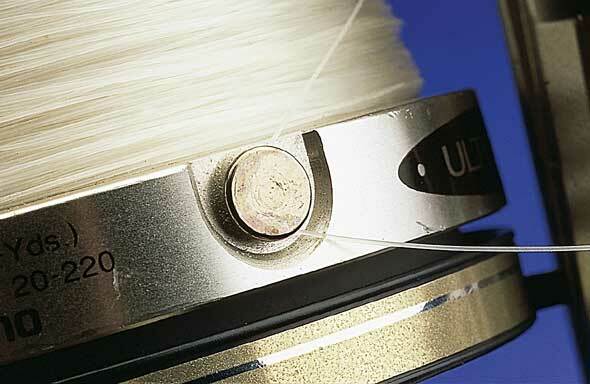 Fixed-spools are the angling favourite around the world, which is why there are so many makes and models. They differ in size, line capacity and quality and you must choose one that is fit for the purpose for the fishing you intend doing. Different sized reels are required for beach casting, estuary and lure fishing, but your final choice is based on line capacity. For clean beach angling 12lb to 15lb line is the standard choice, so a reel that holds around 200-300 yards of 15lb or 400-500 yards of 12lb line is ideal. Reel sizes are usually reflected by their catalogue number; beach reel examples being from 4000 or 450 upwards to 7000 or 800. This is not failsafe so check the line capacity; details are on the spool or box. Beach fixed-spools usually have a spool diameter of around three inches. Look for a model with a spare spool. This gives you the option of loading the second one with heavier line for fishing rough ground or even fishing with braid. Price a major factor. Many of the economy reels, those under £30, will get you fishing, the more expensive models offer better design, engineering, including precision anti-rust ball bearings, oscillating line-lay and a super-smooth clutch. Bright metallic colours, honeycombed spools and bright fl ashy chrome bits often hide plastic parts and cheap engineering, while quality reels have a better corrosion resistance. Beach fixed spools must have a front drag, which is a mechanism on the front of the spool that allows controlled slip to release line when a fish pulls hard. This is rarely used for basic beach fishing and, if you do hit a big fish, it's probably easier to back wind. For beach casting the spool needs to be clamped down hard; only reels with a front drag adjustment allow this. The spool cannot be allowed to slip during a cast because the resulting movement of line would be like a knife running over your finger. Rear-drag reels, where the clutches cannot be tightened down hard enough to prevent line slip, are used for coarse fishing, spinning and plugging. Balance is an important factor. 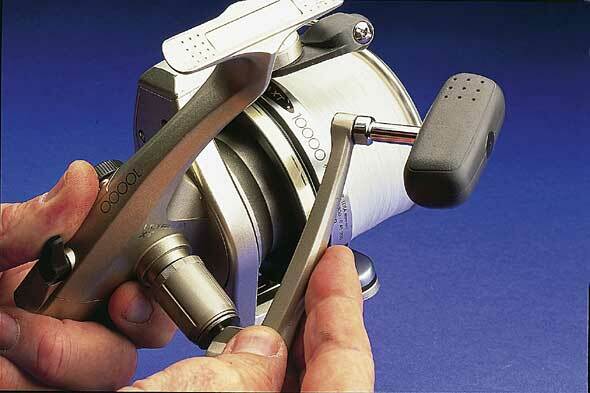 Some reels can be heavy; especially cheap versions and can upset the rod's balance. Take your rod with you when you buy a reel. Finally, look for a model with a comfortable handle (bear in mind that a winter beach is cold on the hands) and a handle that the palm can grip will be easier to use. Modern fixed-spools have a long, wide spool and a line capacity of around 300 yards. There is no need to fill the reel with yards of backing line to fill it up as is the case with older reels and some cheaper models. The wider tapered spool is also contoured to unload the line during the cast more smoothly. The line diameter you use will effect the way the reel unloads the line. Thicker line will decrease the diameter of the spool quickly causing the exposed spool lip to catch the line as the mono pours off. With a thin line (0.35mm mono and below) the spool decreases less quickly and line flow is more efficient because it doesn’t catch on the spool lip. Fixed-spool reels allow the efficient use of lighter mono lines and braid and it is possible to use lines down to 0.06mm from the shore effectively...but don’t forget you will need to attach a shockleader. You can tie the line to the spool using a simple lasso knot or a three-turn grinner knot. Avoid knots in the line because these will stand proud on the spool and catch loops of line as you cast. Fill the spool to the very top of the spool’s lip. This important device moves the spool up and down in a set rhythm so the line being retrieved is laid evenly on the spool as it rotates. The more expensive models have a more intricate oscillating line-lay system, which loads the line with precision so that it doesn’t bed into itself. This certainly improves casting distance. Reels with poor line lay tend to bunch up the line at either the base or lip of the spool, which spoils casting distance. These type of reels also tend to rock or knock when winding in and are probably best avoided. A roller bearing in the bale-arm prevents line twist. The line clip on the side of the spool. Of particular use to the sea angler is the anti-backwind, which is a small lever positioned on the rear end of the reel body. In one position the spool is locked but flip the lever and the reel handle can be turned either way. It is an effective way to release line should a big fish threaten to snap your line; in an emergency you can back wind. A roller bearing in the bulbous end of the bale-arm acts as an anti-twist mechanism allowing the line to run smoothly at right angles to the spool. This may stick on cheaper models, so is worth checking to avoid potential line wear. 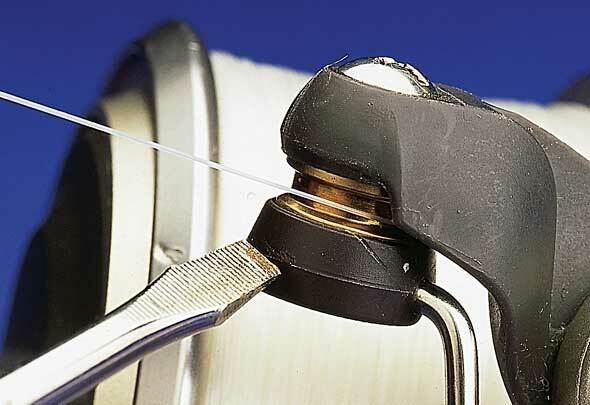 Most spools have a handy line clip on the side of the spool to clamp the end of the reel line; fixed-spools have an annoying habit of shedding loops of line and the clip solves the problem. However, if your line has a heavy leader tied on the end, this tiny line clip will not hold it. A hair band or Velcro rod band should keep it from unravelling. 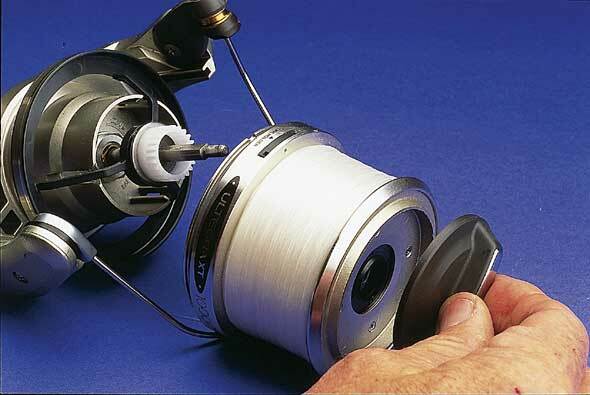 The retrieve ratio of the reel relates to the number of turns of line around the spool per turn of handle. Fixed-spools are faster than multipliers because the spool is bigger and the line diameter on the spool does not decrease by much. All models include an automatic bale-arm return, on some this is simply a bumper the bale arm hits to flip it back into position. On the more sophisticated models the return is internal and far smother. On cheaper reels the bale-arm can stick and you have to wind extra hard to make it flip over and engage. The majority of reels are ambidextrous and can be swapped from left to right-hand wind in seconds. This is a big advantage for left-handers because there are very few multiplier models able to offer this. The reel's handle can be unscrewed and switched to the left or right side. Tapered shockleaders are ideal because the smaller leader knot is less prone to snag loops of line on the spool or the caster’s finger. ● A finger-stall or line trigger allows power casting. ● Cheaper front-drag models can jam if tightened down too much. ● Use braid below 1.15mm diameter. Lines as thin as 0.06mm are ideal for long casting. ● Big Pit reels for carp fishing are ideal for long-range sea angling. ● Don’t panic if you thread the line through your rod rings and find it is outside the bale-arm. Unscrew the front drag, remove spool, open the bale-arm and replace the spool. ● Fixed-spools require far less maintenance than multipliers. Wash the reel in soapy water after use, rinse and allow to dry in the air. Oil occasionally.